The American public education system is a vital institution, making sure that every citizen—no matter how disadvantaged—has an opportunity for self-improvement. But it’s a rough tool at best, and not always suited to the finer points of molding young minds. The juniors and seniors in the documentary The Bad Kids all attend Black Rock Continuation High School, an “alternative” school in the Mojave Desert. They’ve been accepted there because of their ongoing struggles in regular classes. Some are habitual truants. Some are teen mothers or fathers. Some fell behind on their grades as freshmen and then felt too overwhelmed to catch up. 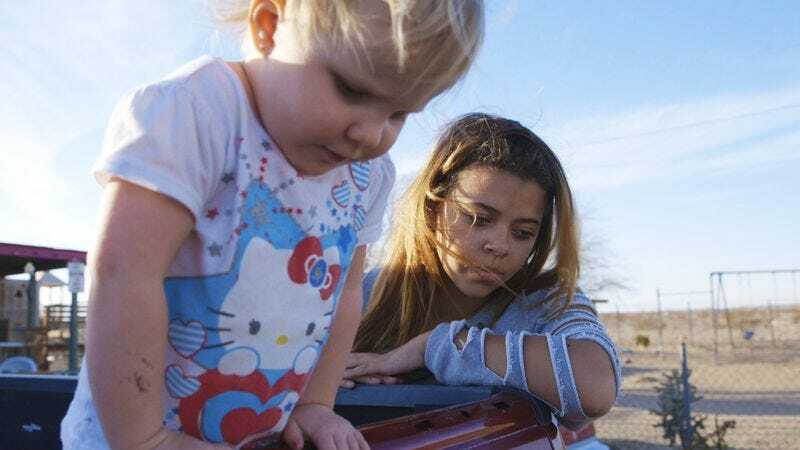 And in nearly every case, the students are dealing with a complicated world outside of Black Rock, managing poverty, abuse, and broken homes in drug-ravaged neighborhoods of dusty San Bernardino County towns like Twentynine Palms and Joshua Tree. For a lot of these children, circumstances have conspired to make school about the third- or fourth-most-pressing issue on their agenda each day. Directors Keith Fulton and Louis Pepe (best-known for their Terry Gilliam behind-the-scenes docs Lost In La Mancha and The Hamster Factor) have made The Bad Kids in the “fly on the wall” mold of Frederick Wiseman, crossed with the “year-in-the-life” storytelling of Hoop Dreams. The structure of Black Rock itself is one of their biggest narrative assets. The students work at their own pace, and can stay as long as they need to—or want to—provided that they maintain good attendance and good behavior and keep racking up course credits. Because they have to check in periodically with the administration to see how they’re progressing toward graduation, that adds a natural element of drama to the film. When the kids fall behind, it’s frustrating. When they get their acts together and start piling up credits again, it’s inspiring. And as they begin to reckon with the idea that they might graduate soon, it’s alternately moving and terrifying. The Bad Kids focuses primarily on three teens: an aspiring musician who goes through stretches where he excels and others where he’s on a drug binge and stops showing up; a good-natured young father whose self-esteem suffers when the mother of his child does better at Black Rock than he does; and an excellent student and sexual assault survivor whose family belittles her ambitions and questions her motives. Fulton and Pepe also spend a lot of time with Principal Vonda Viland, who greets every pupil as they arrive in the morning, calls up the absentees to find out where they are, hands out milk and bag lunches to the ones who don’t get fed at home, and seems to know the intimate details of every child’s situation. “Everybody who goes here has something,” Viland says to reassure kids who get embarrassed when they break down emotionally in class. One of the major points The Bad Kids makes is that most “problem students” have common struggles that could be managed with the individualized attention that big public high schools can’t provide. Stylistically, the film combines low-key scenes of an average school day with more intense one-on-one conversations and even the occasional impressionistic interlude (the latter exemplified by a lovely montage of students sitting in class while the soundtrack turns their audio interviews into a kind of mass internal monologue). Even viewers who made the honor roll back in high school ought to be able to identify with a lot of these teens’ angst and anxiety. Like a lot of adolescents, they’re tired and hungry all the time and have a hard time time seeing the bigger picture as they grind their way through three lost years of English credits in a single semester. They all have the same pat excuses for lateness and slackness, which they use to disguise the deeper problems they’re not willing to confront. They’re all tempted by the prospect of just dropping out. And while they sometimes act aggressively difficult in public, when they’re back in the office with Viland, these youngsters are much more contrite, even sweet. The Bad Kids isn’t overtly an advocacy doc, though it does implicitly make the case that programs like Black Rock’s deserve as much funding as communities can afford. Some might see these students as being rewarded for past misbehavior, getting to spend their days in smaller classes at a school with no punishments (just warnings and then expulsion), where steady improvement earns gift cards from local businesses. But when Viland and her faculty are having to teach graduating seniors about managing budgets, being courteous in business situations, and avoiding abusive relationships, it’s harder to argue that these kids have it soft. This school is trying to serve both academic and parental functions. The process is still imperfect, with plenty of flaws and failures. But it’s better than giving up altogether.